30 minute soup? With veggies and noodles? And it’s all in one pot? Yup. That’s exactly what’s going on here today. 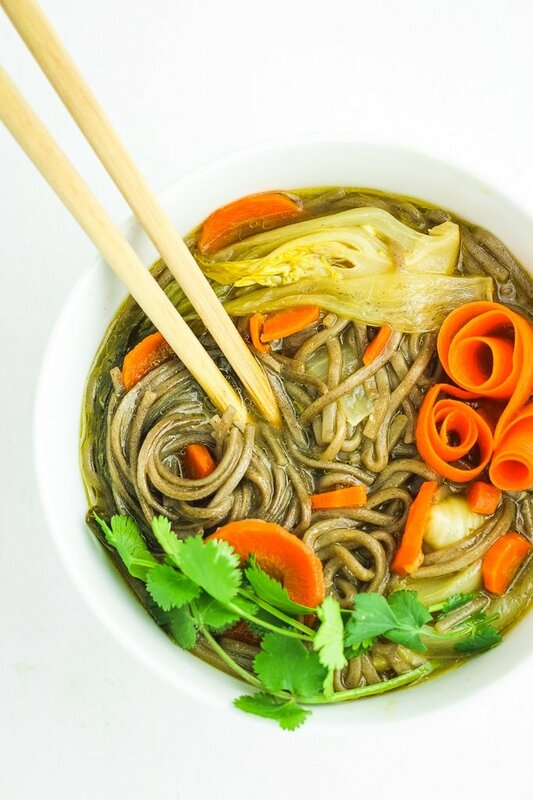 This is a 30 minute soba noodle soup recipe and it’s about to be your new weeknight go-to! Two things before we get to the business of making soup: 1) this soba noodle soup is an older recipe. We originally posted it in 2014. I took new pictures and added in some updates to make the recipe easier to follow. And 2) This soup is 100% Clark’s brainchild. I said “I want soup” and he said “boom.” 20 minutes later, we were sitting down to dinner. Not too shabby. As the recipe title implies, this soup is easy BUT more importantly, it seriously takes only 30 minutes to make. AND it’s all in one pot. I mean, hello guys. This is dinner magic and it’s about to make your life so much happier! I love the tender carrots and the bok choy slivers that soak up the flavor of the soup. It has the slightest hint of spice – just enough, but not too much. 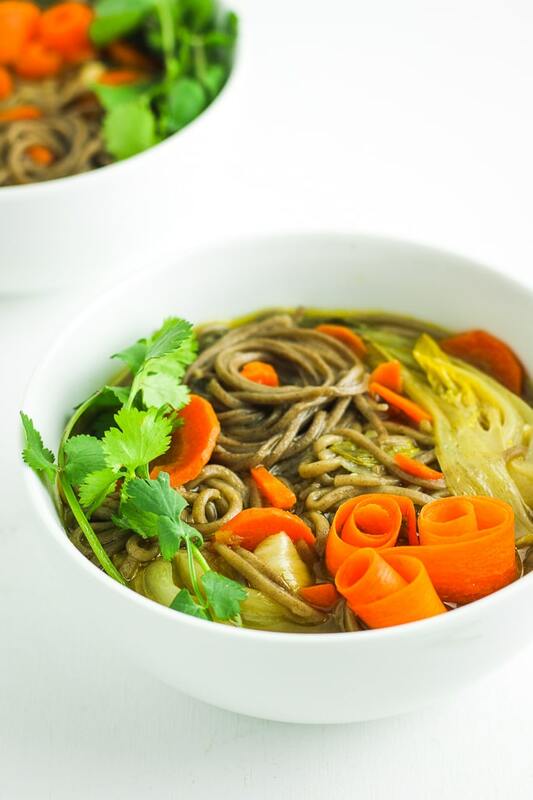 Go get your ingredients and make this Soba Noodle Soup, just make them ASAP and tell me what you think! Tag us in a picture on Instagram so we can share your magic on our stories! Easy, low-calorie soup with Asian flavor and a hint of spice. 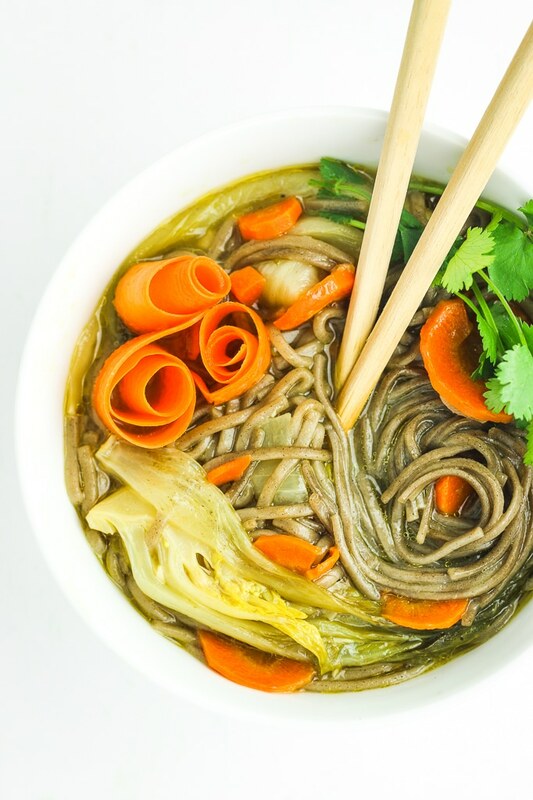 Lots of delicious veggies and gluten-free soba noodles. In a medium pot, bring 3 cups of water to a boil. Add a pinch of salt and soba noodles. Boil for 5-7 minutes. Drain noodles and set aside. In a large pot, sauté onions and garlic in oil. Add broth, tamari, carrots, bok choy, noodles, and seasonings to pot with onions and garlic. Bring the pot to a boil, then cover and simmer for 15-20 minutes. Enjoy! OMG yes! So glad you liked the recipe. This soup is definitely amazing! I noticed you pre-cook the soba. It seems to me that there should be no reason to do that if you are putting the soba into boiling broth for 15 minutes. Wouldn’t that cook the noodles? Hi Mark! You could most certainly try cooking the noodles into the broth. My reason for boiling separately was to keep the noodles from absorbing too much of the soup itself. Let me know how it works! Loved the recipe, for an extra OOOOMPH…I added 2 tbsps of rice vinegar and 1 tbsp of chili sauce. 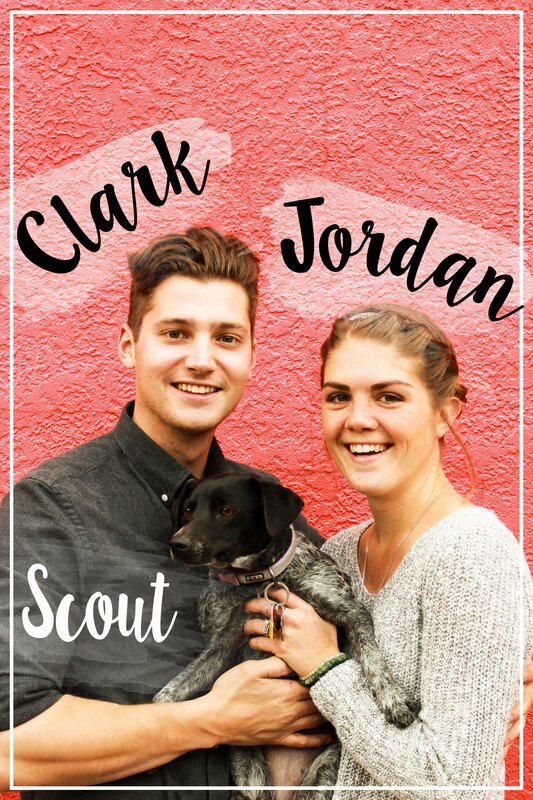 Thank you for the recipe….my son loved it too! You’re a brave one! I’m always hesitant to add spice, but that chili sauce sounds like a fantastic addition. Glad you enjoyed! Thanks for commenting Jacqueline! So glad you liked the soup. :) Hopefully the consistency turns out a little more to your liking next time! I made this tonight as I have been desperately searching for a simple Asian soup recipe! This was delicious! I added baked tofu and broccoli to the soup along with some green onion on top and it was amazing. I did omit the salt just because I didn’t think it needed it. I think next time I will not simmer the veggies as long because i tend to like them a little crunchier (personal preference!). Thank you so much for this recipe! Will make it again and especially great for anyone coming down with a cold (me). So glad you like this soup! Adding tofu and broccoli is a great idea – I bet that made it even better. :) Thanks for your comment! Tha’ts alot of sodium. Is it really necessary? If you need to cut down on the amount of sodium, you could use reduced sodium tamari or soy sauce and omit the teaspoon of sea salt. Hope that helps! I’m going to tweak the recipe a bit as I hate onions (but feel some mushrooms would be awesome). Do soba noodles reheat well? I made this soup tonight! OMG sooooo good! It tastes like healthy ramen noodles!!!! So happy you liked it! This is one of my favorite soups EVER. Most soba noodles on the market are a mix of both buckwheat and regular wheat, just fyi. If you want 100% buckwheat only noodles, I have only seen them sold online, although I’m sure there are some health food stores that sell them. Just a heads up! We ended up finding ours at a small health food store in Greenwood, IN of all places! You can definitely find them online – we have to do that with a specific kind of rice noodles that we love! Have you had any luck finding GF soba in stores? I’ve found 100% buckwheat soba noodles at Whole Foods. There are several brands on the market now. Glad to hear that you found them! I’ve noticed lots of new options popping up, too. Good news! I made this soup last night, it was my first time using soba noodles. I absolutely loved it!! So light, so many flavors. The veggie choice is perfect in this soup although I may experiment with bean sprouts and maybe some cilantro and a squeeze of lime. Sounds like pho!! Thanks for sharing, I will be making this forever. Mmm – bean sprouts! That would be perfect in this soup! I’ll DEFINITELY be adding those the next time we make a pot. So glad you enjoyed! Cabbage is a good substitute for bok choy. Celery would work, too. Let me know what you use! My gf can’t eat onions or garlic. I could probably put a bit in and it wouldn’t hurt, but do you have anything else I could add instead to keep it hearty? I would suggest adding more bok choy and maybe even 1/2 to 1 cup of chopped celery. Let us know what works! A lovely soup. I too love soup and could eat every day. Have a Happy Wednesday. We’re in the same boat! It’s just too good. :) Thanks, and you too! Now this sounds awesome. 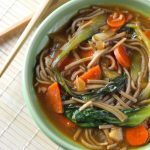 I love a good asian soup, and buckwheat soba noodles are my absolute favourite! I had forgotten how tasty these can be. Friday night didn’t really want to cook but glad I did. I’m a big fan of soba noodles. :) Glad you decided to cook and that you enjoyed the recipe! Did you add the noodles back to the soup and veggies before or after the 15 min. simmer?